Does this ROM have the CWM already installed? I have still the 1.0.4. 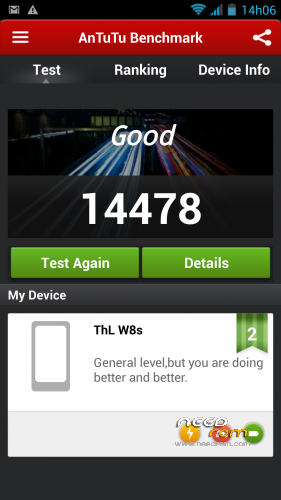 Stock ROM installed(Etotalk ROM) and I have an Antutu benchmark ranking of 15641, if I install your ROM will I get 14478? And will the phone lose performance? Sorry but I'm a noob grateful if you explain. Thanks! What is with the unattended (orphans) "mcube" file. I can't delete it ! This file is unclaimed mcub what? I'm trying to delete with Titanium Backup., Deleting, but I settled again after reboot. Do you planted as a joke of the day, deodexed ROM una! Thanks for the ROM! works great on my phone (w8s)! can i make a request? the only thing that is bothering me, is that home button does not wake the device. can this be implemented? I started using this rom with no issues and then I got the "obtaining ip address" issue and can't connect to any wifi networks. I have found no solution yet. Is it a driver? Do I need to flash or alter any files? Your help is greatly appreciated. after installing via TWRP 2.5.0.0 I am experiencing troubles with wifi. To be more specific – can't turn it on at all. After 5 seconds of waiting it goes of without connecting. Don't know why, maybe the same case as the post above?